Join the Ruffed Grouse Society and ArtsQuest to celebrate the spirit of the hunt with the only area screening of the acclaimed Hunting Film Tour (HFT) Sept. 12, 7:30 p.m., at the ArtsQuest Center at SteelStacks, 101 Founders Way, Bethlehem. Tickets for the event, a fundraiser for the two nonprofits, are $15 in advance at www.steelstacks.org and 610-332-3378, and $20 at the door. 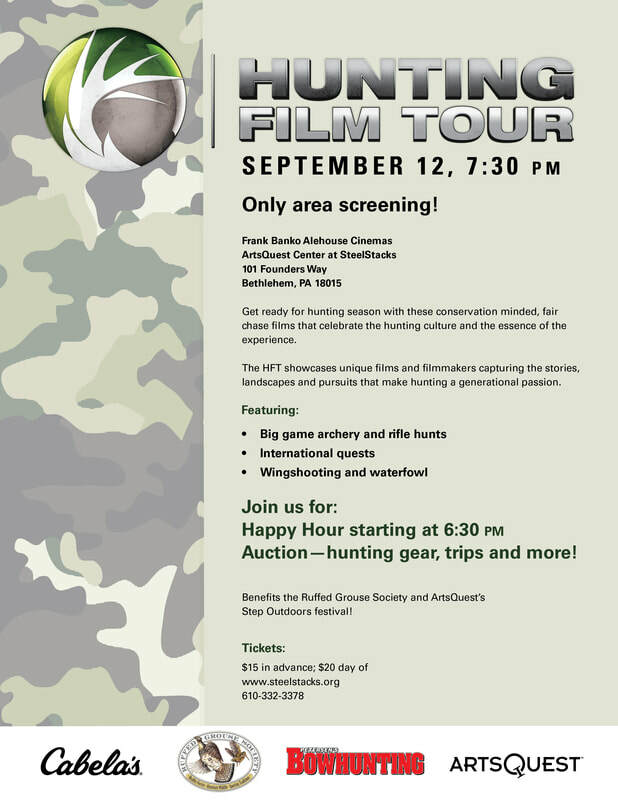 ​Bethlehem, PA---Celebrate the spirit of the hunt with the only area screening of the acclaimed Hunting Film Tour (HFT) on Sept. 12, 7:30 p.m., at the ArtsQuest Center at SteelStacks, 101 Founders Way, Bethlehem. Tickets for the event, a fundraiser for the Lehigh Valley Chapter of the Ruffed Grouse Society and ArtsQuest, are $15 in advance at www.steelstacks.org and 610-332-3378, and $20 at the door. The Hunting Film Tour is not only a showcase of short documentary films focusing on the world of hunting culture, but an incredible lineup of conversation minded and fair chase films that capture the essence of the experience. The tour provides a home for unique films and filmmakers that capture the stories, landscapes and pursuits that make hunting a generational passion. From big game archery and rifle hunts, to exotic international quests and wing shooting, the 2017 tour features several films, each highlighting a different mission. The complete list of films and trailers will be available at www.huntingfilmtour.com in early August. This special evening also includes screenings of the Ruffed Grouse Society’s new “Project Upland,” a unique bird hunting initiative that captures the passions and traditions of the grouse woods to inspire a new generation of upland hunters. This multi-video production, featuring several short films, celebrates those experiences sportsmen treasure in the woods – stories and cherished memories that are essential to engage the next generation of grouse hunters and conservationists. Guest are invited to arrive starting at 6:30 p.m. for Happy Hour to talk with fellow sportsmen, check out the vendors and enjoy a beverage or bite to eat from the ArtsQuest Center’s Mike & Ike Bistro (not included with ticket price). During intermission there will be an auction and raffle, with the chance to win hunting gear, trips and more. Proceeds from the Hunting Film Tour benefit the Ruffed Grouse Society’s conservation work in the region, as well as ArtsQuest’s Step Outdoors Festival, a two-day, free event in June that encourages families and children to explore their outdoor pursuits. Supporters helping to make the event possible include Cabela’s. For more information on the HFT event at SteelStacks, visit www.steelstacks.org.